Last month, over 25 Old Republic Contractors Insurance Group (ORCIG) team members from all over the country made the trip to Houston, Texas for the 38th IRMI Construction Risk Conference. Made possible by ORCIG’s Gold Sponsorship, all of the conference attendees—over 1,300 leading project owners, general contractors, subcontractors, developers, and insurers—were invited to attend the IRMI Monday Social Reception at the Marriott Marquis Houston. 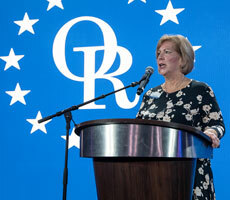 The following evening, ORCIG invited its many broker partners and insureds to its Annual IRMI Party held at Grotto Ristorante in Downtown Houston. Among the festivities of the evening included the presentation of this year’s Old Republic Contractors Award of Excellence, which was awarded to an insured contractor of over ten years with ORCIG.